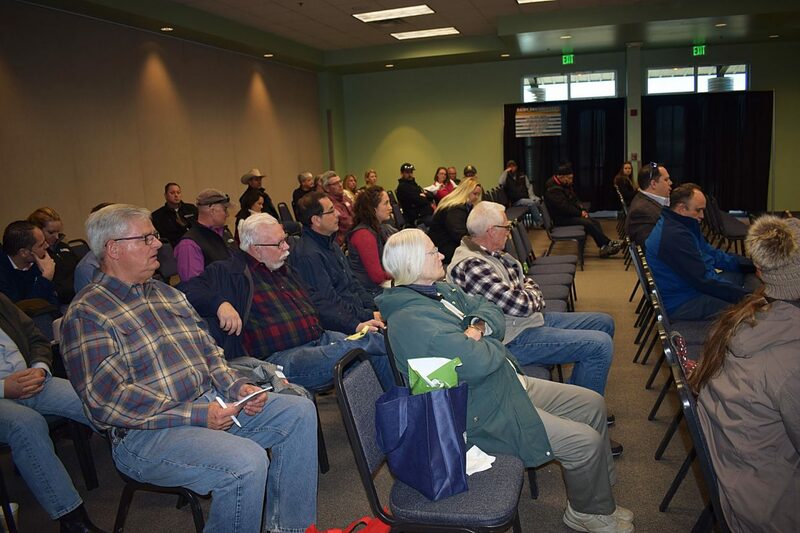 A packed room of producers were on hand for a dairy cull cow presentation during the Colorado Farm Show held recently in Greeley. As the dairy industry continues to put more focus on the welfare of their cattle, progress is being made to ensure cows are fit to be transported when they are culled from the dairy herd. Lily Edwards-Callaway, who is an assistant professor with the Colorado State University Department of Animal Sciences, talked to producers about the welfare of their dairy cattle and safely transporting them during a presentation at the Colorado Farm Show held in Greeley. Fitness for transport issues are becoming more important as the country becomes more concerned with animal welfare issues, Edwards-Callaway said. "What does fitness for transport mean, what does it look like, and who does it matter to? Dairy cows have a dual-purpose career. It is essential that we consider what is best for them in regards to milk and meat," she said. Nearly a third of cows are culled annually from U.S. dairy herds, and most are culled due to health and productivity issues. "More than 75 percent of the cows deviated clinically from the normal condition," Edwards-Callaway said, referring to a recent study. In this study, 31 percent were lame, 20 percent had mastitis, and 22 percent had wounds, but all of them were considered fit for transport. Edwards-Callaway asks, "When a cow leaves the farm, do we know what her journey will be like?" Nearly 92 percent of dairy operations have sold some cows through a nearby livestock market, and 37 percent have sold cull dairy cows directly to packing plants. Edwards-Callaway refers to a National Beef Quality Audit completed in 2016 that looked at 154 loads of cull cattle. That report showed, on average, dairy and beef cows were in transit for 6.7 hours, but a few were in transit for more than 24 hours. Edwards-Callaway reminds producers that once they bring cull cows to the livestock market, they have no idea how far she will be transported once she is purchased. "Road transport can be stressful with multiple handling events, mixing with other animals, handling by various people, no milking and changes in ownership," she said. During their journey, these cows will have times where they don't have access to feed or water, and the journey to their destination may be long. Because of the stress, Edwards-Callaway believes producers need to be more pro-active in their culling techniques, considering if the animal is actually fit for transport. The condition of the animal and the distance it is expected to travel should be considered, and it may not hurt to have the herd veterinarian play an active role in that decision, according to some research consultation conducted in Canada that Edwards-Callaway shared. The study also stated that producers should train their personnel to become more involved in recognizing and handling animals that need to be culled, she said. Many times, dairy cows are culled for clinical conditions or weaknesses that aren't normal or the same as beef cull cows. "Dairy cows have a higher risk of becoming non-ambulatory during a long haul," she said. "They also have a higher risk of dying, and a higher incidence of becoming dark cutters." 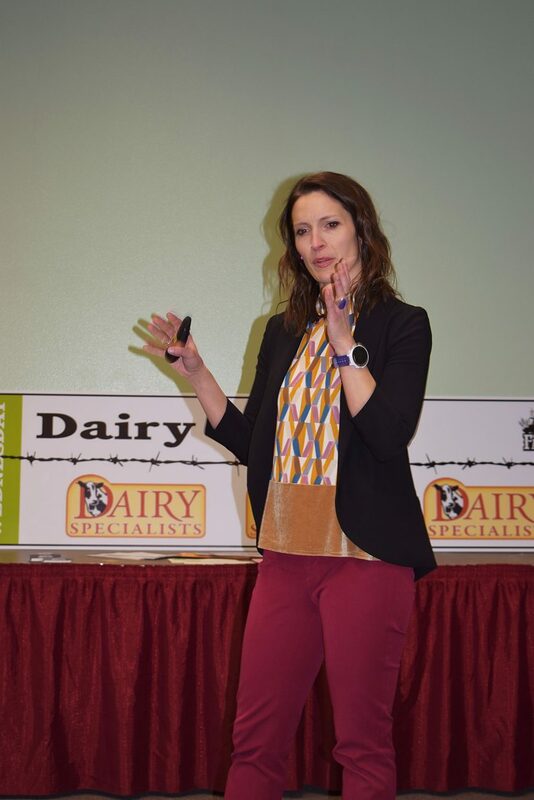 Edwards-Callaway shared some research showing that dairy cows spend more than 50 percent of their time lying down, and if they are deprived of that time, they will lie down even longer. During transport, animals may be denied the ability to lie down for long periods of time. However, Edwards-Callaway reminds producers this is not unique to the dairy industry. "What are the financial disincentives for sending unfit dairy cattle to market?" she asked. Producers may profit on the sales price, if the cow makes the trip. There may also be savings associated with euthanasia and carcass removal. Livestock auction markets may worry about losing a consignor's future business, if they don't accept their cull cows. "They may just go down the road to the next market where they will take them," she said. Processors need to consider how much margin they can make from processing a lean cow, death loss transporting that cow, and the possibility the animal may not pass regulatory inspection. Other considerations are scrutiny by in-plant inspection, alignment with retail and customer expectations, and quality defects, she said. The 2016 BQA report also showed 64 percent of carcasses from cull bulls and cows were bruised. Edwards-Callaway tells producers that cows and bulls typically show more bruising than fat steers, which may be attributed to the semi trailer being too short for taller dairy cattle. Referring to the report, Edwards-Callaway said looking at the relationship between body condition and bruising, cull cows with a lower body condition score had more bruising. "Only 3 percent of the animals experience a traumatic event at unloading. Nearly 71.4 percent of these bruises were dark red or purple, which means they are not very old bruises," she said.